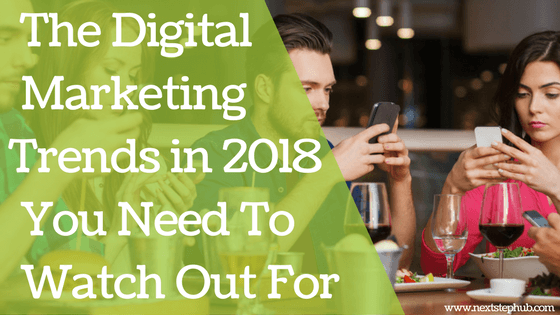 Staying on top of digital marketing trends in 2018 is crucial to your business’ success. The digital landscape is ever-changing. The technology evolves in the speed of light and online marketing trends come and go. These developments have the power to influence customer behavior and loyalty. If you won’t keep up and adapt, your brand’s sales and relevance might lag behind. In this article, we will help you enhance your marketing strategies by giving you the 2018 digital marketing trends. Live video usage and viewership soared last year, and it will remain popular in 2018. According to surveys, 80% of brand audiences prefer watching live videos than reading blog posts. Facebook also confirmed that live videos get higher engagement than other types of content. Facebook users spend 3x more time watching a Live video compared to a video that’s no longer live. In addition, keep in mind that live videos appear higher in the News Feed as well. So jumping into this trend can give your content more exposure. Instagram enjoyed a significant growth last year. Their recent feature “Instagram Stories” even became more popular than Snapchat. Due to better engagement and good advertising features, more brands are using Instagram to market their products and services. LinkedIn refreshed its user interface, which gave more opportunities for B2B marketers. Its advertising platform helped brands reach highly-targeted groups of professionals, so we can expect more companies to try their luck on the platform. Meanwhile, Twitter had a rough year. It failed to grow users because they focused on user acquisition instead of improving their ad platform. The result? Marketers found it hard to connect with their audience, which forced them to leave the site. If Twitter won’t enhance their ad platform soon, experts predict that the site will struggle in 2018. The rise of smartphone and social media usage give more freedom to customers to share their experiences. They leave reviews on websites and social media pages, and potential consumers read them before they purchase a product. Because of this, brands are focusing on customer experience marketing. They make sure to meet their clients’ expectations by providing personalized experiences. They also encourage their customers to leave reviews and suggestions on their pages and websites. When executed well, this strategy can help you keep customers and build loyalty. It will also give your company a good reputation, since people always equate brands with experiences. In simple terms, augmented reality or AR brings elements of the virtual world into our real world. Graphics, sounds, and touch feedback are added to the natural world to enhance user experience. When used as a marketing tool, AR takes the available digital data and creates an integrated 3D image of a product. It allows consumers to experience that product up close and personal. For example, clothing brands are creating virtual fitting rooms for their customers who have no time to visit their stores. Augmented reality marketing or AR marketing is considered the future of marketing. Experts say it’s poised to skyrocket to $117.4 billion by 2022. People have been using voice search for years. And since there are more voice-activated devices today like Google Home, Amazon Echo, Siri, and Google Assistant, this trend is becoming more popular. In fact, Google claims that 20% of queries on its mobile app and on Android devices are voice searches. The number is expected to soar to 50% by 2020. Because of this, brands must pay extra attention to optimizing their content for voice search. One way to get started is to utilize long-tail keywords. It’s also smart to create Q&A pages that answer the common questions of your customers. Take note of the keywords or phrases that they use when asking questions, then use them to create valuable content. AI will continue to revolutionize marketing in 2018. Many brands are already using AI to tailor their content according to their customers’ needs. In fact, 86% of companies surveyed believe that AI is an efficient and effective marketing tool. It lets them personalize their marketing and reach their target market. Influencer marketing was hailed as the fastest-growing online customer-acquisition channel. It beat organic search, paid search, and even email marketing. Recent statistics show that 49% of potential customers rely on influencer recommendations. So there’s no doubt that this trend will stay in the scene. However, remember to be authentic when using this strategy. Consumers prefer natural content than overly-staged ones. Make sure that your target audience can easily relate and connect with your influencer. 80% of internet users own a smartphone, which makes mobile the most popular way to browse the web. Also, 80% of social media time is spent on a mobile device. If your site is not yet optimized for mobile, now is the right time to do it. To check if your site is mobile-friendly, use Google’s Mobile-Friendly test tool. This will evaluate how easily your audience can visit and use your page on a mobile device. In the digital marketing world, change is the name of the game. So always update your knowledge on the latest trends, tools, and marketing tactics. And of course, remember to research first before you take the leap. Make sure that your strategy will fit the needs of your brands and your customers. We love hearing from you! Which of these marketing trends are you planning to try in 2018? Share it with us in the comments!